BUSCHMAN STORE IS THE ONLY SELLER WHICH IS AUTHORIZED TO SELL BUSCHMAN FURNITURE. DON’T RISK PURCHASING BUSCHMAN FURNITURE FROM OTHER SELLERS BECAUSE OF INCREASED SIGHTINGS OF COUNTERFEIT LOW-QUALITY ITEMS. 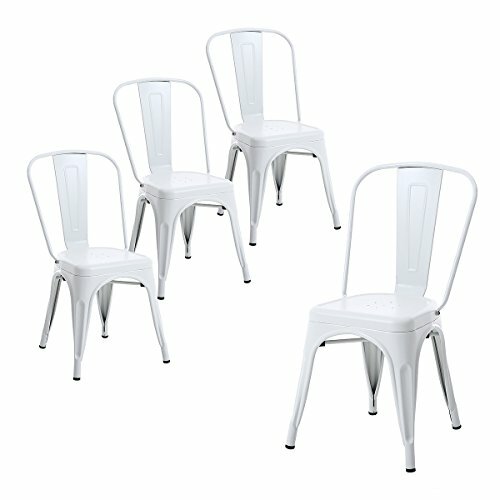 Sturdy but elegant, these vintage Tolix-style metal chairs with curved back come in a set of four. Stackable for easy storage, these outdoor chairs are perfect for commercial use in a bar or bistro patio, or as outdoor seating in a cafe or restaurant; with their attractive powder coat finish, they also make a perfect and practical choice for use in a home garden or deck. Also suitable for indoor use, the French design of this set of 4 chairs makes for an appealing vintage industrial touch to a living room or kitchen. Their durable construction will stand up to regular use in an outdoor environment. Whether for home or commercial use, make your seating a point of conversation, instead of just chairs. KEEP AWAY FROM RAIN.